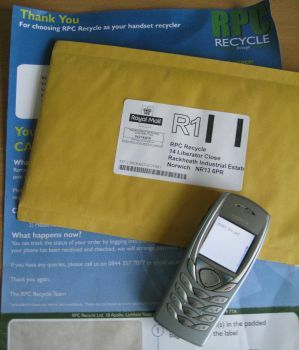 In our quest to test out the major UK mobile phone recycling services, we now turn our attention to RPC Recycle. This service is keen to push the benefits of using their recycling service to ensure that your phone is recycled in an environmentally friendly way, and rewarding you with a cash payment. 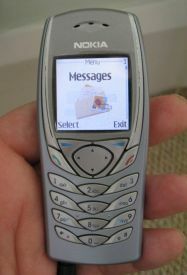 For this test, we used a fairly old phone, the Nokia 6100. Being quite an old phone with no special features, such as a camera or web browser, our hopes weren’t high, but RPC Recycle offered to take it off our hands, and out of our dusty phone draw, for £1.50. Not exactly a fortune, but it’s enough to allow us to try a test with this company to see how well it performs compared with the other “make cash from your phone” services out there. Signing up and getting the details registered was a quick process. No need to enter the phone’s serial number, and we got through process in about a minute – faster than Mazuma, Fonebank and Top Dollar. Phone return: You can pack and return the phone yourself, get a Recorded Delivery pack (which will cost approx £2 to return), or get a Freepost pack, which is handy for low-value phones. 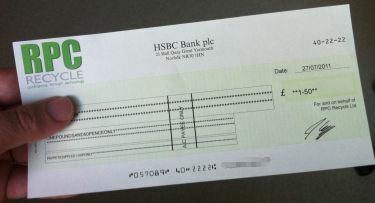 We’ve opted for a cheque payment, and to be sent a Freepost pack. This turned up quickly, within 2 days, and we packaged up our handset. It was posted off, in the supplied first class padded bag on the 20th July 2011. RPC Recycle works a treat. Comparing this company against some of the others shows that they’re not the fastest, nor are they the slowest. The level of communication was good, and it was a no-hassle service. If you’ve used their services, we’d love to know. Please let us know in the comments below. AVOID THIS COMPANY! I Was quoted 220 for my blackberry z10, only a couple of months old and in perfect working order. They reduced the value after inspection by 40 quid! Due to.. yes u guessed it… light scratches on the screen, which might I add still had the screen protector on it. This company is an absolute joke, its now costing me to get my phone posted back and if u do try and fight it by emailing them the emails are now failing and redirecting back into your inbox. Unless ur willing to take at least 15% from your original quote DO NOT USE THIS COMPANY! I was quoted £61 for a excellent condition Blackberry 9780 which had had a screen protector on since day 1. I failed to receive an email stating that the phone had been re-valued at £42 because of scratches to the screen and the area above the screen?? I received payment of £42 and when I realised this was the case I emailed and was told that an email had been sent. All my emails from them are still in my inbox, I did not receive the re valuation one. I feel this is a very clever way of paying the reduced amount and basically ripping people off. Don’t use them. A complete con especially if you have a very recent phone. 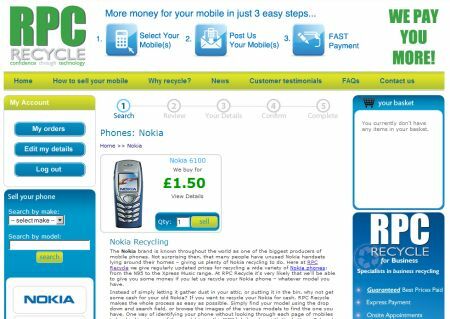 I selected this company to recycle my iphone 4s as they quoted the best rate – £210. Paid £7 to send the phone to them and also sent the cover as I thought this would give extra protection. When they received it they offered me £150 and cited excessive wear and tear from their Ts & Cs as the reason. If you look at the T&Cs things listed under this section include major damage like missing buttons and camera not working. My phone was in full working order but they said it was scratched. I told them to return it which they did minus the cover (for a further £3)! I could see no scratches on it whatsoever. I have since sold it on Gumtree for £200 to a man who inspected it thoroughly and said it was in great condition. RPC clearly use this ‘excessive wear and tear’ clause as a get-out and never intend to pay the figure they originally quote. DO NOT USE THIS COMPANY – YOU HAVE BEEN WARNED!!! i used RPC and thought their prices was the best but then the scam started. i got an email saying the screen was scratched on one of the phones and they changed the price they had offered me by half. i would not use them again as i know i had checked the phones prior to sending and they were perfect. total scammers. just avoid them.